I have said many times that I consider myself extremely fortunate to have the job that I do. I spend most days working with smart people to solve real problems in a creative and collaborative environment. In recent years, I have got into the habit of taking a photo of the whiteboard or flip-chart at the end of a session. It is my usual practice to ask groups what they think they have learned from their participation in a workshop. Of course, I am interested in what they are going to do in the immediate future as a result of having attended the session. However, I also ask them to summarise the key, underlying principles that they will take away. Lessons that will be useful again and again in their jobs. These are usually recorded as short statements or aphorisms that we record and share post course. Below is a de-duplicated list of lessons recorded over several years of working with sales managers (in many different industries) on the topic of managing sales performance. We use it as an aid to coaching sales managers and as a checklist for helping sales managers decide what a great performance really looks like, (hint: it’s more than a great set of results). 1. Learning ≥ Change or we are failing to perform. Our ability to perform is always affected by external factors, markets change, customers change and competitors change. If the sales team is failing to develop and learn at a speed that is at least equal to the rate of change they are falling behind and performance will suffer. 2. Everyone has the ability and potential to perform at a high level. Managers who get the best from their staff share this belief. People tend to live up to our expectations of them. If we believe that staff are incapable of high levels of performance, we begin to act upon that belief and our staff adjust their performance to meet our expectations. Your starting point should always be to expect a great performance from everyone. 3. No one comes to work to perform badly! People under perform for a whole range of reasons but in general there is never an intention to perform poorly. Sometimes the best way to get a great performance out of people is simply to remove the things that are holding them back. 4. High performing people tend to adapt the job to suit their strengths. Sometimes the best way to get a great performance from a team is to devise a plan that allows them to play to their strengths rather than to try and eliminate all weaknesses. 5. High performing people tend to share similar traits. Attitude plays a huge role in performance management if you can identify those traits that make the biggest difference in your marketplace. Sometimes replicating a few key skills or traits across the sales team can have a huge impact on performance and results. 6. Managing performance is a balancing act between internal and external forces. A coaching approach to sales is often the most effective means of improving sales performance. Sales people who have the skill and self- awareness to develop their own performance are the most valuable asset on your sales team. An obvious but important point. Developing sales performance requires that the sales manager is aware of the different learning types on their team adaptable in their approach to training and coaching. Great coaches have a detailed knowledge of all the factors that drive performance in their field. They have high levels of insight into individual and team performances and are able to pay attention to even the smallest details. Performance management is the art of producing the results that you need over the longer term. It is everything that you do to produce the result rather than the result itself. Whenever we run Performance Appraisal courses for clients, we usually begin the process with a debate about whether there is a role for Performance Appraisal in fast moving modern businesses. There are many good reasons given for not running appraisals. Many people have memories of awkward meetings with their boss trying to make sense of things that happened months before. Others admitted that they were always somewhat guarded in appraisals because they were concerned that any negative marks could affect their pay. Others still reported that in their experience appraisals were used (by their boss) as a way of getting six months worth of negative feedback into an hours meeting or that the feedback they received was so generic as to be useless. The “If” being that appraisals are worthwhile so long as there is a robust performance management process in place. So it is worthwhile taking a moment to identify the different elements of the performance management mix and to put the performance appraisal into it’s proper place as an essential component in the mix that will only work if the other parts of the engine are functioning well. If your appraisal system isn’t working for you, then perhaps it is best to take a look initially at least, at your whole Performance Management System. Many of these Performance Management Processes share similar characteristics. Most involve one to one dialogue and a degree of action planning. It is important, however, to remember not to confuse the measures or to try and combine them. A Performance Appraisal can be likened to a service on a car. The point of the service is to check all working parts, not just to address short-term problems. This way, the car will run efficiently and optimally for many years because problems have been avoided. In the same way, the appraisal should look at all aspects of performance, not just the problem areas. How does Performance Appraisal Differ from other Performance Management measures? Job Review Employee is changing jobs (through promotion restructuring etc) or the nature of their role is changing This is a meeting to review and amend the job description and the key performance indicators associated with it.The meeting should take place every time there is a significant change in the employee’s role or responsibilities. Coaching Whenever there is a development need for which coaching is the most appropriate option. Usually a series of one to one meetings focused on developing a key skill or achieving a specific goal. Pay Review To communicate and or discuss remuneration terms. This should be done at least annually (even if no award is made) or after a major shift in role or responsibility. Pay Review decisions should be made with reference to results as reported in a Performance Appraisal.They should not be a major part of the appraisal process. Avoid doing Pay and Performance reviews in the same meeting if at all possible. Disciplinary Meeting Whenever there has been a breach of rules or professional standards.Disciplinary meetings can vary in severity from informal “reminders” to formal written warnings. Disciplinary meetings should take place close to the occurrence of the problem behaviour.Disciplinary meetings should never be combined with appraisals. Career Counselling Meetings between Manager and staff member to discuss long-term career goals and opportunities. These should occur by mutual consent There is an element of career counselling within all appraisals, however, the appraisal must primarily be about current and future performance. Performance Appraisal Occur at regular intervals (2 or 3 times per year).All employees should have the right to an AppraisalThe aim is to review and analyse current performance and identify ways to develop future performance Performance Appraisals are a regular and systematic review of every part of an individual’s performance.Usually one to one meetings, the primary focus is to improve individual performance. One of the most useful discussions we have in our management programmes is based around a checklist The 7 Areas Of Motivational Influence. Furthermore, the more we learn about motivation and engagement (from people like Dan Pink in his book Drive that the factors affecting the levels of commitment that an individual commits to a given task or goals are many and complex. which when combined create an environment in which people can motivate themselves). Our preferred method is to put 7 flipchart sheets up around the training room and then get the group to move around each one adding comments on post it notes until they have built their own picture of what drives motivation in their workplace and have generated ideas to enhance levels of motivation. Leadership matters when it comes to motivating staff. People need a clear idea of what is expected of them, they need to know why doing their job to the best of their ability matters to the wider team. People need to know that they will be supported and developed, they need to know that they will be trusted to get on with the job and that their efforts are appreciated. They need to know that they are working for a good company and for people who will make the right decisions for the long term good of all the company. Everything you do to invest in the quality of Leadership will provide returns in the form of increased motivation. Remuneration and its effects on motivation is a vast and complex subject. However, there are four major principles to bear in mind. It is not how much you pay a person that really matters but how they perceive their remuneration package. If a package is perceived as fair (in the context of colleagues and the marketplace), if it is enough for them to live without the constant worry of money matters) and they believe that it is within their control (i.e. there is a clear link between what they achieve and what they can earn) then people will not be de-motivated by their remuneration package. Remuneration is largely a hygiene factor, if it is perceived as unsatisfactory then the de-motivational effect is significant. If however people are broadly satisfied with their remuneration then it tends to be other factors that affect how motivated they are with their work. Rewards are the non-cash awards that are made after staff have achieved an exceptional performance or put in an exceptional effort. Rewards can come in many forms from a box of chocolates to a holiday. They can also be non-tangible benefits such as “time off” offered to teams who meet their targets early. How satisfied we feel at work depends upon many factors and those factors vary between individuals (see career drivers). However there are some key elements that always get mentioned in surveys where people report high levels of job satisfaction. Need for Goals and Results. People need to know that they are purposefully moving on. People are objective orientated animals i.e. they work most efficiently when they have a clear idea of what they wish to do, and they have a feedback loop that tells them how well they are doing in relation to the goal. Training. 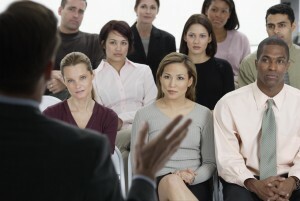 Training does much more than improving selling skills. If people feel they are improving have a training plan set out for them, they will keep working and stay loyal. Progression. Some people are ambitious. Help them achieve promotion, show them exactly what they have to do and provide them with regular appraisal. The degree to which our work is aligned with our values has a direct impact upon the level of commitment and energy we give to it. Security (a desire to know how things will be in the future) is a very common and powerful, although seldom- admitted motive. Our sense of security plays a significant role in our levels of motivation. b) Lack of security means high turnover of staff and lack of purposeful activity. Standards. We all have a need for clear performance standards – people need to know where they stand. Worry about their positions is destructive – a major disincentive. Belonging: Man is gregarious and in a sense, one of the things we look for at work is sociability and the ability to mix. People generally do not like to be isolated, when they do feel isolated they tend to worry more about security issues. a good leader brings to the team. People want to feel good about the work that they do and the results that they achieve. We all want to be considered significant and important. De-motivation creeps in when we begin to feel that what we do doesn’t matter to the team or the organisation as a whole. Make sure they know how important they are to the company, but also make sure they are well served i.e. good back up, clear printed business cards etc. Make people feel that the job they have is an important one and the products they produce are ones they should be proud of. Q. WHICH CUSTOMERS TEACH US THE MOST! A. NOT THE ONES YOU MIGHT THINK. My favourite business book from last year was Inbound Marketing by Dharmesh Shah and Brian Halligan. I thought that they did an outstanding job of explaining in the most clear and practical way how to harness the potential of Social Media to create a flow of inbound enquiries. For any business, the idea of customers coming knocking on their door is an attractive one. There are many really great stories out there of companies that excel at selling millions of dollars of product via inbound marketing strategies. This is particularly the case in the software industry. Companies like Hub Spot, Atlassian, 37 Signals Red Gate and Fog Creek have all become the poster boys for Inbound Marketing. Any entrepreneur who is serious about building a strong business, one that can generate real sales revenues quickly, should have an inbound marketing strategy. But I am going to sound one word of warning. I have clients and colleagues who have become very adept inbound marketeers, but many have become overly reliant on their marketing to deliver sales. They watch their bookings rise and fall with each campaign, and they adjust their marketing to ensure that they learn from their mistakes and put a great deal of effort into ensuring that their customers are happy. This means customer surveys, exclusive offers, free upgrades, invitations to join user groups etc. All well and good, and when things are going well for a business and everyone is making money there is no good reason to do much else. However, customers who are attracted to your product, who trial it and who buy it straight away are only one small part of the potential market and in some ways they are the least interesting segment. Customers who are naturally attracted to you don’t teach you much. While they may suggest ideas for improving the user experience or alert you to bugs, they basically love you, love your product and have proven their devotion by parting with their cash. They are the low hanging fruit! Much more interesting, in my view, are the clients who were attracted to your company and your product and who didn’t buy. They made a decision that something else was better (that something else may be another product or simply the status quo) and they kept their credit card firmly in their pocket. A couple of years ago I was discussing just this issue with a client who has developed a document management system for use on major oil and gas projects. He had produced a video explaining the benefits of the product and had generated a fair number of leads. He was in discussion with some of them and looked close to doing a deal with two or three. The people who were close to buying were all very similar, they were all working on a similar type of project (albeit for different organisations) and all the projects were at a similar stage. I asked him what he was going to do with the 60 plus leads who had seen the video but who had not asked for a meeting. He shook his head and muttered something about sending them a questionnaire. These leads, who were interested enough to download a trial product but not committed enough to buy, are where a sales person really earns their money. Talk to these people and you will find that the reason that they lost interest is sometimes banal – “oh I like the product, I just never got round to it” (an immediate sales opportunity), sometimes a matter of timing, – “I liked the product but the project we are working on has been put back until January” (a future sales opportunity), and sometimes a problem that needs solving – “I like the product but I need to keep all our data within our firewall, it can’t be on external servers” (an opportunity for further dialogue or even product development). These are all direct quotes from the 60 people I called on my client’s behalf. From those 60, people we created another 8 meetings. Also, some of the feedback we got helped us to develop our understanding of how the market perceived the product which in turn led to us rewriting a couple of the key messages on the website, and creating additional content for the video. We would never have learned any of this without a call. So you should (if you haven’t already), buy the book and build an inbound marketing strategy. But don’t forget to talk to the people who like the idea of your product but who have not yet committed, they often have much more to teach you than those who buy immediately. I have spent the last couple of weeks catching up with clients and friends in business, partly just because New Year is a good time to catch up and partly to assess the mood out there amongst business owners and sales and marketing people as we move into 2011. Encouragingly many are starting to think about boosting the size of their sales teams once again. Indeed some are planning interviews and assessment centres in the next week or so. During one such discussion with an old friend and recent customer, they reminded me that in many of my presentations to sales managers that I offer the following advice. If in an interview for a sales role the decision comes down to a choice between a candidate who asked the most interesting questions and the candidate who did the best pitch, you should always go with the person who asked the best questions. Preparation: Asking great questions is a sign that the candidate is really well prepared. Intelligent and appreciative inquiry requires that they have bothered to look beyond the landing page of your web site and that they have dug around and really thought about the stuff that they found there. Agility: Great sales people need to be adaptable and responsive to the needs of the customer, if a candidate is comfortable to ask questions and able to adapt their message dependent upon the answers you give, then they are demonstrating raw sales potential whatever their level of experience. A slick pitch can sound impressive but if it is delivered by rote it will fail to inspire your customer. Listening: You know that someone is a natural (or experienced) questioner when they are able to gently elicit the customer’s needs by allowing the answers that they get to be the mother of the next question. Unlocking difficult customers: You cannot talk a doubting customer into believing your pitch, (at least I haven’t seen it happen in twenty plus years of working with sales people) however you can always unlock an unarticulated need, or help a client to see things from a different perspective by asking questions that start a process in the client’s mind. (more on this in a future post). So give me a great questioner over a “pitch meister” any day!